Acknowledging the importance of gender equality and the empowerment of women to the vision of the 2030 Agenda for achieving inclusive and sustainable growth around the world, UNIDO strives to systematically adopt a gender perspective throughout the planning and implementation phases of its interventions, from cluster selection to monitoring and evaluation. 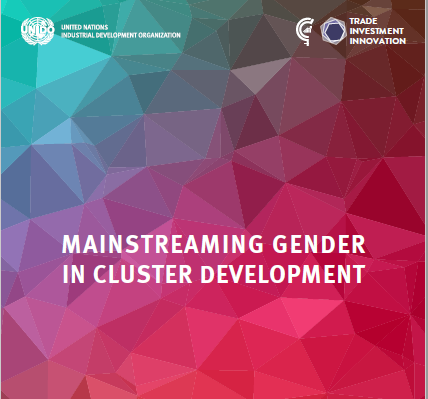 This paper explores UNIDO’s approach to gender mainstreaming in its Cluster Development Programme by focusing on the critical factors that need to be integrated into a cluster development project, and on the problems and limitations that can arise. Providing context on gender and development, introducing the key issues to consider when conducting a gender-aware analysis, the first part of the document aims to equip practitioners with the understanding of key concepts that are useful to tailor development interventions in such a way that unintended gender impacts are mitigated or avoided, and that existing gaps are addressed. The second part of the document overviews UNIDO’s experience with gender mainstreaming in its cluster development methodology and offers a set of guidelines to improve gender mainstreaming practices in UNIDO’s interventions through country-based examples and best practices that have offered effective entry points for more equitable project outcomes and for the advancement of women’s economic empowerment. For a thourough reading please see the attached paper. This document was prepared by the Department of Trade, Investment and Innovation (TII) of the United Nations Industrial Development Organization (UNIDO), based on the work of Mrs. Mariangela Linoci (gender expert) and Ebe Muschialli (UNIDO cluster expert), under the supervision of Fabio Russo, Senior Industrial Development Officer at UNIDO in close cooperation with the Office for Gender Equality and Empowerment of Women.